The marvels of the Caribbean Sea are, without a doubt, one of Grenada's most magical attractions: on-board a catamaran, we will have the opportunity to enjoy the beauty of the sea in complete relaxation. 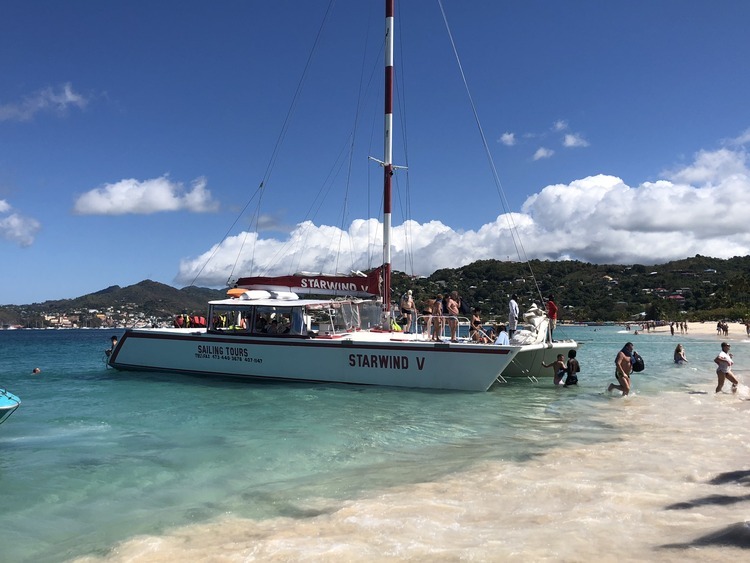 Our excursion starts at the port of St. George, where we will hop on-board a Starwing V motorised catamaran sailing along Grenada's western coast, until we reach Molinière Bay, which many consider to be the best place on the island for snorkelling. The bed of the bay includes a series of statues created by the English artist, Jason de Caires Taylor and placed on the sea bed so that the local marine plant and animal life can build their home here. After having explored the marvellous sea beds and the underwater world of the Caribbean Sea, we will head towards Grand Anse, one of Grenada's most beautiful beaches. Here, we will have some time relaxing on the beach or swimming before we return to the port.